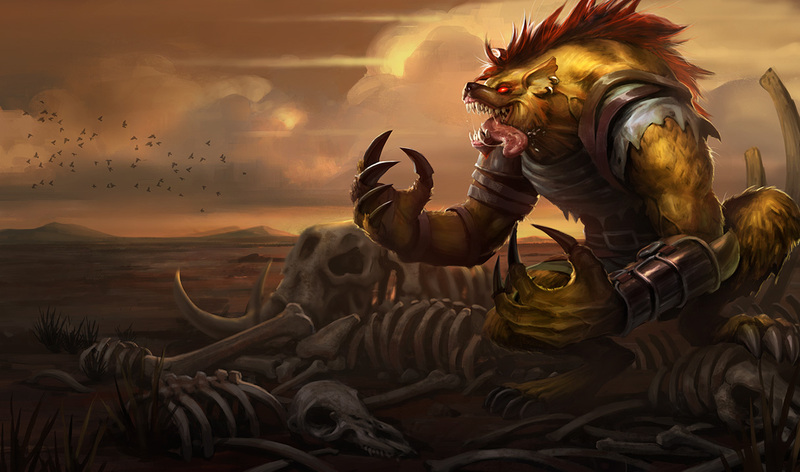 The jungling champion Warwick is a werewolf, but one of his skins is a hyena. Guess what I play? Today I reached Summoner Level 11 in League of Legends. I feel I am nearly ready to face actual human opponents without (overly) embarrassing myself. I’ve also managed to earn enough IP through my games to buy a small stable of champions in the various roles that I’ve been able to practice with. Fear is honestly the only thing keeping me back now. I have a lot of those moments, where I let fear of failure dictate my actions. I suppose I should say my inaction. I’m having a similar issue in school since I got behind. Just like it’s easy to continue fighting bots and not improving in League, it is easy enough to let class slip by and say, see, I screwed up. But it is time to take the plunge and pass into the dark depths of the jungle. Both in League and elsewhere. Anyway, in League the role of the jungler has proven to be a bit easier to grasp than I anticipated. I watched ScrapComputer’s guide on jungling, which is great, even if it is a little outdated for season 5. Mostly the monster camps underwent a change in the current season of the game. So I just looked up a guide specifically for that and things have been peachy. N.B. If you have no idea about the term, League of Legends happens in three “lanes”, and between those lanes is a mass of twisty paths and neutral monsters called “the jungle”. A jungler is a character who basically wanders around this area and kills the stuff there. Since it encompasses so much, the jungler also weaves in and out of lanes to ambush (“gank”) enemy players, putting his or her team at an advantage. 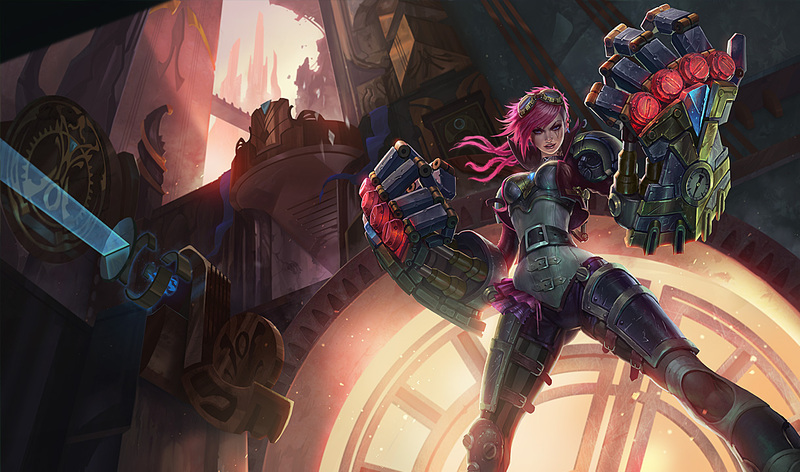 Vi is a jungling champion who uses her giant mechanical fists (and justice) to crush her foes. Having a jungler in the AI levels has made a noticeable impact. I’d say the games end about 3-5 minutes earlier. I’m able to help out other lanes that aren’t doing so good, filled with players who are new and/or not so great. Typically, when playing the AI, everyone typically sticks to their lane until the AI Bots move around and dictate where the team fights happen. I don’t want to fight bots forever, I’m practicing to get prepared for human opponents, so I am trying to get a familiarity with those tactics even if the AI matches aren’t exactly mirrors of typical PvP situations. The mid lane is still my strongest game, though. I still need to go into a custom game and work on upping my CS (“creep score”; how many enemy minions you struck the final blow to and thus reaped XP and gold). You see, in League you can’t just auto-attack everything and expect to get by. For maximum efficiency you need to time your hits so that you land the last blow on enemy minions. That’s how you increase your gold and buy better items, which give you better stats. I watched a video where someone said you should be able to easily get 70 creep kills by the 10:00 minute mark before you attempt playing ranked matches. I’m only going to be playing “normals” at the moment (non-ranked 5v5 PvP games), but improving never hurts. Now I need to apply the same principles to my academic work. Heh. This entry was posted in Games and tagged 500 words, League of Legends, personal, school by Shaun. Bookmark the permalink.